I love making cute and useful things for my home. One of such things is a candlestick. I have made one out of glass bottle using decoupage. My can has broken it. Now I used a different technique. Just before New Year they started to turn off the light in Ukraine for several hours a day. So, it’s a pretty useful thing, too. Here is what I made out of a small green energy drink glass bottle. I have already used these to make outdoors fire torches. Now, here is my short upcycling DIY course for you. I used hot gun glue to attach the organic thread to the glass bottle. I just rolled the thread around the bottle and glued it in several places. It took me about 10 min to finish this up. It’s pretty easy and the thread or rope doesn not have to lay smoothly on the bottle. As you may see, it is attached unevenly. In some places you may see the green of the bottle come through. 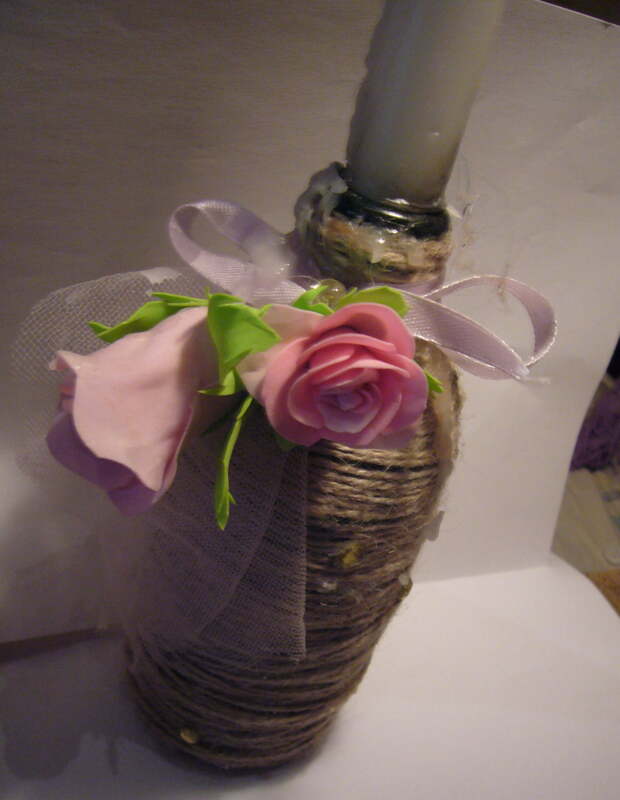 Since it is a romantic candlestick I used some pink crystals and glued them on in several spots. 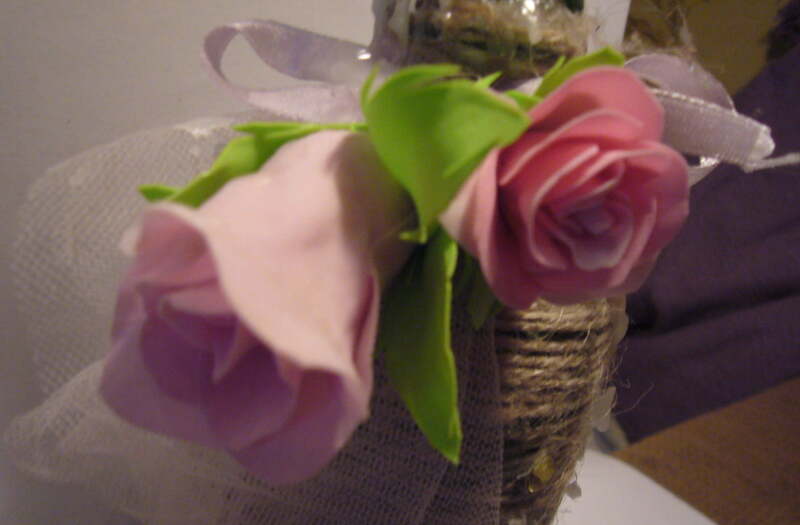 Then I made a small decoration composition our of handmade fom flowers (I made these rosebuds myself), ribbon and pink veiling. I glued the whole composition together using hot glue gun and then attached it to the candlestick. It serves nicely. The bottle is heavy enough and it does not overturns. I head up the bottom part of the candle a bit and stick it into the bottle hole. That’s how it works. It’s an easy, fun and eco friendly upcycling DIY project. 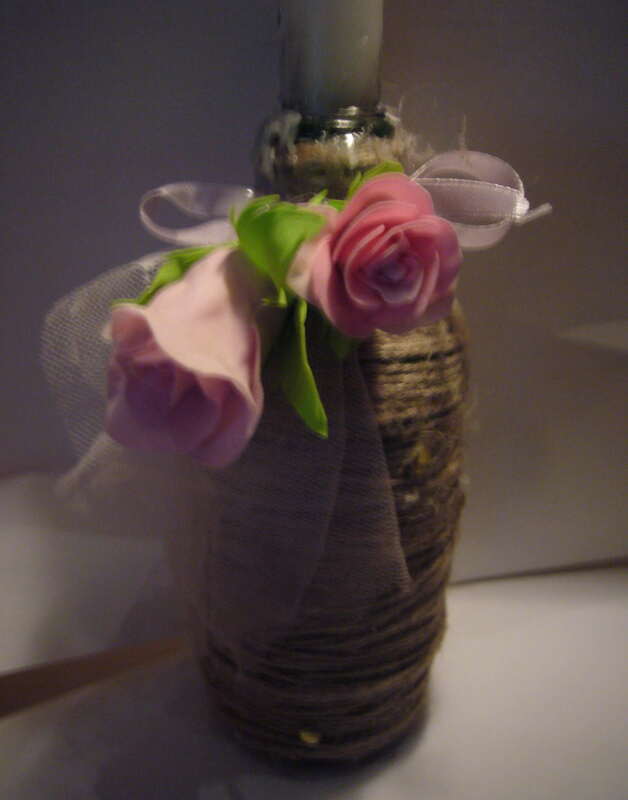 This entry was posted in Crafting Tutorials and tagged candlestick DIY, DIY, DIY project, glass bottle candlestick, handmade flowers, handmake candlestick, upcylcing. Bookmark the permalink. Great ideas! Is there a u tube video, or somewhere on the internet on how to make your pretty roses on the candlesticks?